Think of soils as the ‘skin’ of the Earth. Their depth varies from negligible (only a few millimeters) influenced by forces which have moved them such as wind, water, weathering, and human activity; to several meters deep where they exist untouched by these forces. Soils exist in layers, or ‘horizons’, each with their respective importance from the short term management to the longer term formation processes. The primary components of soil which affect how we manage them include textural influences like sand, silt, and clay, which relate to the parent material deposited from various activities like glaciers, volcanoes, and other natural depositions from millions of years ago; and more recent activities relating to more natural and biological processes, like organic matter, and the creation of a generally termed ‘loam’. Climate; flora and fauna (including human presence and activity); topography or slope; and time; all come together to create the ‘skin’ we use to grow crops. These five factors define what we call ‘soil forming factors’. Tropical climates with high temperatures and rainfall yield deep, strongly weathered, and leached soils with relatively low available nutrient levels in the surface zone. The primary means of nutrient replenishment in these regions is from the growth, life cycles, death, breakdown, conversion to organic matter, and ultimately, the mineralisation of available nutrients from lush vegetation indigenous to the region. Arid climates where precipitation is scarce and evaporation rates are high, will characteristically accumulate calcium carbonate (limestone) and calcium sulfate (gypsum) in the surface soil due to the lack of rainfall which would normally move them through to the horizons below. In temperate climates, as the name suggests, the formation of surface soils will be influenced most by changing seasons, where the warmer months of the year allow for bacterial action and active chemical conversions. These soils will be shallower and less weathered than those in tropical regions. Finally, in arctic climates, soil formation is even more restricted. The physical processes associated with freezing and thawing are their strongest influencers, and exist with a permanently frozen subsoil, called ‘permafrost’. Events of millions of years ago (glaciers) played an important function in the distribution of soils across primarily subarctic and northern temperate regions. Glacier movement during the Ice Ages literally removed all the soil material from the poles of the earth and deposited them as they thawed, creating what we call ‘younger soils’ across these regions. Early soil scientists in Russia identified the concept of ‘Zonality’ as it pertains to soils was identified. It generally differentiates ‘Zonal’ soils as those corresponding to the major climate belts of the Earth; and ‘Azonal’ soils which are not yet in equilibrium with present-day climatic conditions. A third category would be ‘Intrazonal’ soils, which are strongly influenced by local conditions other than climate. These categories and basic factors influencing how soils are formed and the differences between them are important to understand for Agricultural systems across the planet. For example, when managing ‘younger’ soils of the temperate regions (US, Canada, most of Europe, etc) farmers gauge their rotations and crop suitability to many different drainage patterns, pH, and climate. Due to the fact that their soils can vary so much even within a few acres, their need to be more precise with fertilizer, pH amendments, plant protection materials, tillage, and rotation have become increasingly important, and can have a significant impact on profitability and environmental impact. The depth of their soils can be limiting as well, with many areas needing to manage a productive crop in as few as 8” of soil (or less) in the top horizon…losses due to erosion can be very damaging, whether from water on slopes and exposed surfaces, or from wind across vast areas such as the Midwest and upper Midwest of the US. In the Tropical and Sub Tropical Climates of many countries, farmers must be able to adjust their crop selection within the limits of their markets. They must also manage with Agricultural infrastructures that are still in development, though their acceleration in the eyes of the optimist is ever increasing. Knowing that their soils in many of these regions are deep, ‘older’ soils, that have been weathered and are sensitive to land clearing and intensive cultivation, it is important to ‘build’ their soils so as to sustain life at all levels within the ‘skin’. 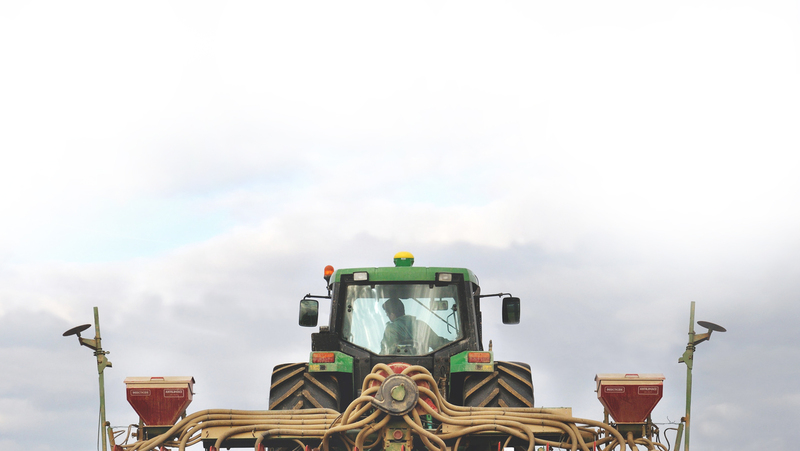 Things like microbial populations which have been breaking down organics provided by the biomass that occupied the rooting zone will be their ‘friend’ as they attempt to shift what is being grown to arable crops. Conservative use of chemicals is also important, as is the understanding of how to effectively shift systems without harming the existing ecology of the area. Using crop rotations that provide cover, can ‘feed’ the soil so as to create a living soil resource, preventing erosion, and other soil conservation practices are an important consideration. Not only do these practices sustain the soil resource, but they will contribute needed nutrients to the new crops that will be planted and those which follow in the rotation. No matter where you farm, the first friend you must make is your neighbour…the second is your soil. We as an industry have also been learning about the human impact on the ecology and sustainability of soils and systems across the globe. Over the past 20 years, more emphasis has been placed on the understanding of cultural practices which enhance sustainability, and avoidance of practices which adversely affect it. Concurrently, concerns for the fate of chemical based amendments like fertilizers and plant protection chemicals in the environment and the food chain are bringing new products and practices into Agriculture that reduce or eliminate their use. With new technology in digitization, and Internet based data sharing, a trend to further understand the soils of countries and regions of the world has created a whole new set of tools for those providing information to farmers in developing countries. For example, in Africa, accurate soil information has been difficult to attain historically. As a result, soil characteristics haven’t been considered as much while planning agricultural systems and environmental plans for several areas of the continent. The Africa Soil Information Service (AfSIS) is an international programme funded by the Bill and Melinda Gates Foundation and others which is charged with developing up-to-date high resolution digital soil maps of the continent. The first version has been published on the internet, drawing on 12,000 geo-referenced soil profile datasets from 37 countries. The integration of data across sources like databases, books, reports, and articles combined with remote sensing data from near infrared images which identify such factors as vegetation, climate and terrain relief, water distribution, and more; are analysed and then summarized to estimate soil properties in non-desert areas of Africa. To assist the user, the accuracy for various pieces of information are also estimated. The ultimate goal of this project is to provide easy access for farmers to this very powerful data. Through the use of hand held smartphones and other devices; experts can manipulate and analyse response data and can deliver fertilizer and land management recommendations in real-time to the farmer and those advising him. Following the experiences with mapping soil properties of Africa, ISRIC is now working on making similar soil property maps for the entire planet at 1 x 1 km resolution. 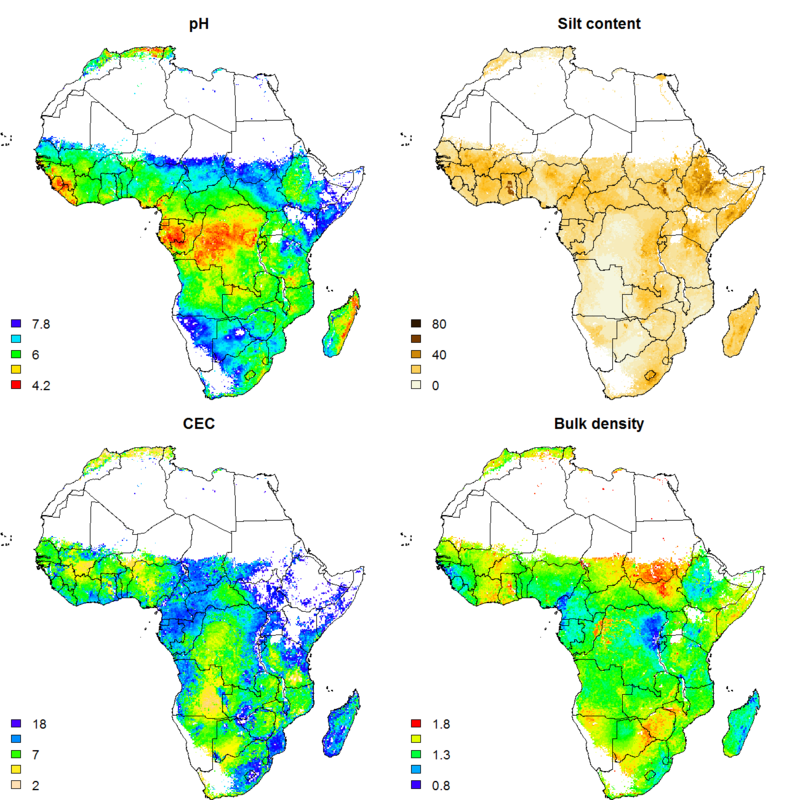 Here are four such maps which show color coded and shaded levels of pH, Silt Content, Cation Exchange Capacity, and Bulk Density for areas mapped digitally in Africa. These are key considerations when exploring relative suitability to a wide variety of crops, and when overlaid with climate and weather data; can tremendously advance our agricultural systems in many countries. In my next follow up to this article, I’ll address the process involved in the effective clearing of land for agricultural production…the do’s and don’ts.. the things to know before clearing, and how to do so while retaining and enhancing the land you are bringing into a productive food source.